You are at:Home»March»March 16»March 16, 1621: Big Surprise for Pilgrims at Plymouth Colony! March 16, 1621: Big Surprise for Pilgrims at Plymouth Colony! The Pilgrims had already seen evidence of Native Americans as they explored the area prior to choosing a site for their first village, including burial mounds and mounds that contained stores of corn. They had helped themselves to some of the corn, meaning to use the seeds to plant as their own crop in the Spring. On other occasions, Native Americans had fled when spotted by the Pilgrims, and on at least one occasion the Natives had launched arrows at the “invaders,” eliciting some small arms fire in return. Samoset is recorded as having been entertained by Christopher Levett, an English sea captain, while aboard ship in the harbor at Portland, Maine in 1624. Samoset’s death is estimated to have occurred in 1653, in Bristol, Maine. 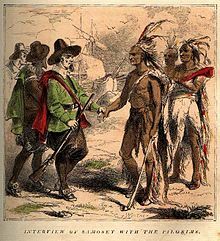 Samoset had also made introductions between the Pilgrims and other important Native American leaders, acting as a sort of ambassador between the Whites and Indians. 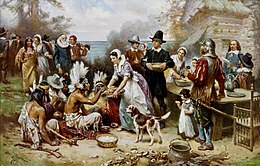 A 1622 account of Samoset’s interaction with the Pilgrims is related in Mourt’s Relation, a booklet formally titled A Relation or Journal of the Beginning and Proceedings of the English Plantation Settled at Plimoth in New England, written by Edward Winslow and William Bradford, a primary source for our knowledge of the history of the Pilgrims at Plymouth. So why is the booklet titled bearing the name “Mourt?” Because the account was erroneously attributed to somebody named George Morton (aka George Mourt) that was a Puritan involved with the same people that sailed on the Mayflower, but Morton did not make his own voyage to Plymouth until 1623, dying the next year. Native Americans played a large role in the successful colonization of North America by Europeans, sometimes voluntarily in a friendly way, sometimes by the establishment of trade. 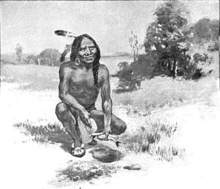 European settlers certainly learned a lot about the land and ways to survive from Native Americans, especially the use of corn (Maize) as a food crop. Questions for Students (and others): What Native American do you most associate with friendly relations with White European settlers? Were you taught about Samoset in grade school? How about Squanto? Please let us know in the comments section below this article. Anonymous. Mourt’s Relation: A Journal of the Pilgrims at Plymouth. Applewood, 1986. Bradford, William. Of Plymouth Plantation. CreateSpace, 2018. Seelye Jr., James E. and Shawn Selby, editors. Shaping North America. ABC-CLIO, 2018. The featured image in this article, a map of the Plymouth Colony by Hoodinski, is licensed under the Creative Commons Attribution-Share Alike 3.0 Unported license. Previous ArticleMarch 15, 2019: Mass Shootings at Mosques in New Zealand Broadcast by Bodycam! Next Article Is There No End to Naval “Oops” Moments?